Lake Como Villa tapestry shows a lakeside villa in the famous region of Lake Como. Based on the work of artist Robert Pejman, this tapestry shows the idyllic and beautiful life on the water in one of the most coveted regions in Europe. The romanticism and pristine way of life here are reflected in the way Pejman portrays the Lake Como villages. Here we see a single boat docked near its home, with terracotta walls and plants and red flowers which decorate the buildings here. The reflections on the water is beautifully rendered with a hint of the passage to the larger areas of the main lake just around the corner from here. The masterful use of color as well as composition is evident here, as the teracottas echoes the reds of the flowers, as does the blue to the greens of the foliage to create a balanced and harmonious scene. The region has a mild Mediterranean climate and as such has been a favored home for centuries for aristocrats, royalty and visitors who wanted an idyllic landscape and way of life as well as climate. This harmonious beauty ease of life is well represented here in this tapestry. 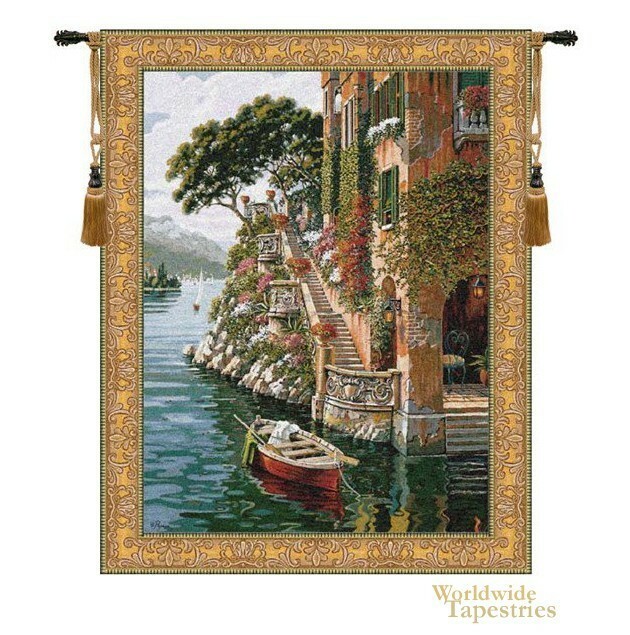 This landscape tapestry "Lake Como Villa" is backed with a lining and has a tunnel for easy hanging. Note: tapestry rod and tassels, where pictured, are not included in the price. Dimensions: W 46" x H 64"
Dimensions: W 66" x H 84"